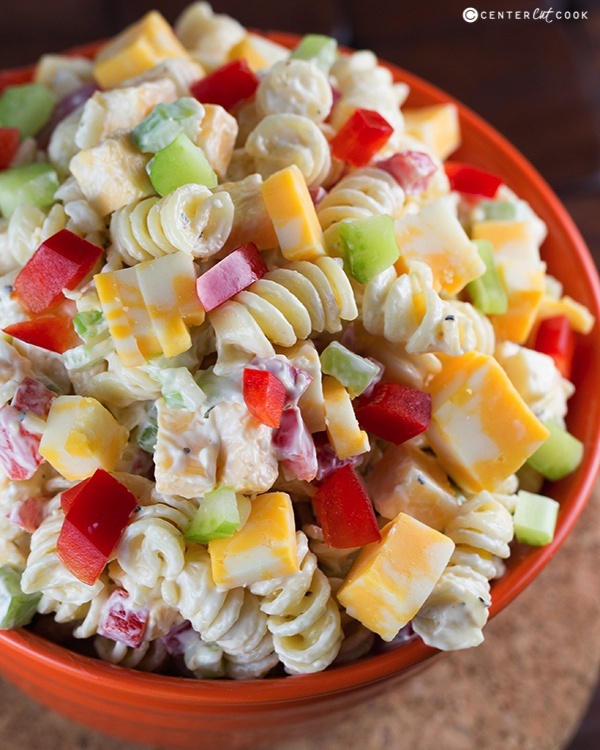 Creamy Cheddar Pasta Salad with a simple dressing is a fantastic side dish for a summer BBQ! It’s versatile too – add in broccoli or any other veggies that you’d like! Pasta salad is like the ultimate summer side because it’s versatile with so many different options to change it up. While I love a classic macaroni salad like my recipe for Easy Macaroni Salad or my BBQ Macaroni Salad with smoky kielbasa sausage, I’ve discovered a new pasta salad that I like just as much… Creamy Cheddar Pasta Salad! And don’t forget to check out our other amazing pasta salads! Wal-Mart sells a Broccoli Cheddar Pasta Salad that is pretty popular, so I used that as inspiration to come up with this recipe. The Wal-Mart version uses tricolor rotini and includes broccoli while my version uses regular rotini (although you can use any pasta that you’d like) and red bell pepper and celery in place of the broccoli. Of course you can use broccoli if you’d like, but I used pepper and celery simply because those were the ingredients that I already had on hand and they add fantastic crunch! One of the most important elements to a good pasta salad is the dressing. I used mayo, a little bit of sugar to sweeten it up a bit, and some apple cider vinegar to add a little zing! 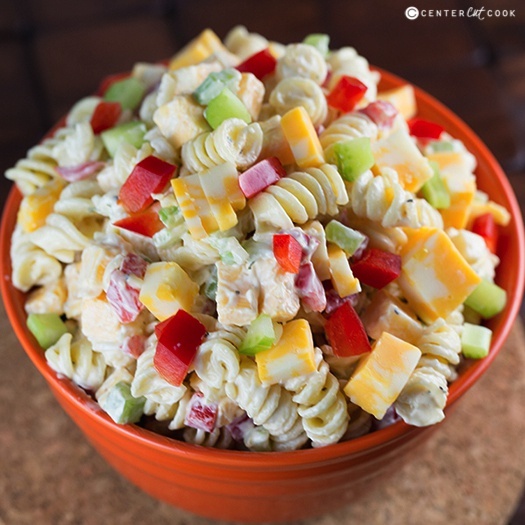 It wouldn’t be cheddar pasta salad without the cheddar cheese, right? I’ve made it with a mild cheddar cheese, and I’ve also made it with cheddar-jack cheese. Use whatever you have on hand, just make sure to cut the cheese into small bite-sized chunks. Be sure to let the pasta salad chill in the fridge for about an hour before serving. Enjoy! Cook rotini according to package directions, then drain and rinse under cold water until the pasta has cooled. Drain well. In a large bowl combine mayo, sugar, apple cider vinegar, black pepper and dried parsley. Combine the rotini with the dressing, then stir in chopped red bell pepper, celery, finely chopped onion, and chunks of cheese. Chill for one hour before serving. Enjoy!